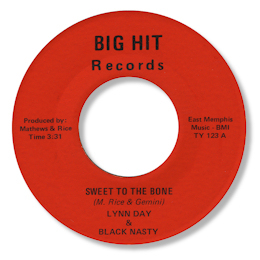 Detroit singer Lynn Daye recorded for the city’s godmother of the blues, Johnnie Mae Matthews. And as so often with Matthews’ productions, Day’s releases were raw and gritty soul rather than the more pop orientated “soul lite” styles so prevalent in the Motor City. I enjoy his initial release which was a strong double sided effort more blues than soul, but it showed off what a strong vocalist he was. His second 45 had a strong uptempo side “Stop Pussyfootin’ Around” and a belter of a deep ballad on the other. Sweet To The Bone starts off with some tasty horn flourishes, and then Lynn comes in softly at first, then harder and with more emphasis. This is quality singing quite clearly, with Day being especially impressive with his sense of dynamics. I love the organ player who holds it all together too. From this music to giants of real Detroit artists like Darrell Banks is a very small step. Note the involvement of Sir Mack Rice as writer and co-producer on Day’s 45s. The backing musicians on the second disc were Black Nasty, a self contained group which included two of Matthews’ kids, who later had a funk/rock album on Enterprise that included the lovely mid paced floater “I Have No Choice”, their version of a tune Matthews had previously cut for Big Hit. In the 80s Day returned to the studio cutting a couple of 45s for the Boss label. The melodic mid paced “Would It Be The Same” is easily the pick of the cuts.